Department for Health, University of Bath, Bath; senior research fellow, South West Academic Health Science Network (SWAHSN), Exeter. NIHR Collaborations for Leadership in Applied Health Research and Care (CLAHRC) West, University of Bristol, Bristol. Background The loss of GPs in the early stages of their careers is contributing to the GP workforce crisis. Recruitment in the UK remains below the numbers needed to support the demand for GP care. Aim To explore the reasons why GPs leave general practice early. Design and setting A mixed methods study using online survey data triangulated with qualitative interviews. Method Participants were GPs aged <50 years who had left the English Medical Performers List in the last 5 years (2009–2014). A total of 143 early GP leavers participated in an online survey, of which 21 took part in recorded telephone interviews. Survey data were analysed using descriptive statistics, and qualitative data using thematic analysis techniques. Results Reasons for leaving were cumulative and multifactorial. Organisational changes to the NHS have led to an increase in administrative tasks and overall workload that is perceived by GP participants to have fundamentally changed the doctor–patient relationship. Lack of time with patients has compromised the ability to practise more patient-centred care, and, with it, GPs’ sense of professional autonomy and values, resulting in diminished job satisfaction. In this context, the additional pressures of increased patient demand and the negative media portrayal left many feeling unsupported and vulnerable to burnout and ill health, and, ultimately, to the decision to leave general practice. Conclusion To improve retention of young GPs, the pace of administrative change needs to be minimised and the time spent by GPs on work that is not face-to-face patient care reduced. It has been the policy of successive UK governments to address the challenge of the growing healthcare needs of the ageing population by transferring care into the community setting.1 In the 10 years prior to 2011, the GP workforce in the UK had an annual average increase of 2.3%.2 However, this was only half the rate of other medical specialties.3 Patient demand for GP services in England continues to grow, with an estimated 340 million patient consultations per year, an increase of 40 million since 2008.3 The UK Department of Health (DH) has set a target that half of all medical graduates entering postgraduate specialty training should go into GP training.4 However, despite the longstanding DH policy to increase GP training numbers in England to 3250 per annum, GP recruitment has remained below this target, at around 2700 per annum.5 The cost of 5 years’ foundation and GP training programmes is £249 261 per GP.6 It is therefore imperative that these highly trained professionals are retained within the UK primary care workforce. In the 5 years between 2009 and 2014, 45.5% of England’s 12 690 GP leavers were aged <50 years, while 30.6% were aged 50–59 years, and less than one-quarter were aged ≥60 years.7 This early loss of GPs is contributing to the GP workforce crisis.8 In 2013, Health Education England and NHS England commissioned this mixed methods study to investigate why so many GPs leave the NHS below the age of 50 years.9,10 This article summarises the main reasons for leaving. GPs who were aged <50 years and had left the English Medical Performers List between 2009 and 2014 were recruited through articles in BMA News as well as direct mailing. Twelve NHS area teams (ATs), between them covering 40% of the population of England, sent invitations to some or all of their early GP leavers. In total, ATs mailed 413 early leavers, and 143 participated in the survey. At the end of the online survey, participants were invited to take part in an interview and 38 survey participants volunteered. Of these, 21 returned signed consent forms. Semi-structured interviews were carried out by telephone, guided by an interview schedule that was developed to complement and extend the survey questions.10 Interviews lasting 40–60 minutes were audiorecorded, transcribed verbatim, and all identifying information was removed. Almost half of GP leavers in England are aged <50 years. Key drivers for leaving early relate to changes in the NHS, resulting in loss of professional autonomy, and in overwork, stress, and burnout. General practice in the UK has undergone a series of organisational changes culminating in an increase in day-to-day administrative tasks, which have come to adversely impact the doctor–patient relationship. To improve retention of young GPs in practice, time spent on work that is not face-to-face patient care needs to be minimised. Fieldwork notes contextualised the interview data and detailed summaries of each interview were produced. Thematic analysis was used to generate themes, both within and across the dataset.11 The phases of analysis included coding, followed by the identification and clustering of themes and sub-themes, and the production of a descriptive thematic summary. Team members each coded three transcripts, before comparing their analyses for inconsistencies and agreement. Finally the themes and sub-themes were grouped to construct a more interpretative narrative across the dataset and depicted diagrammatically (Figure 1). 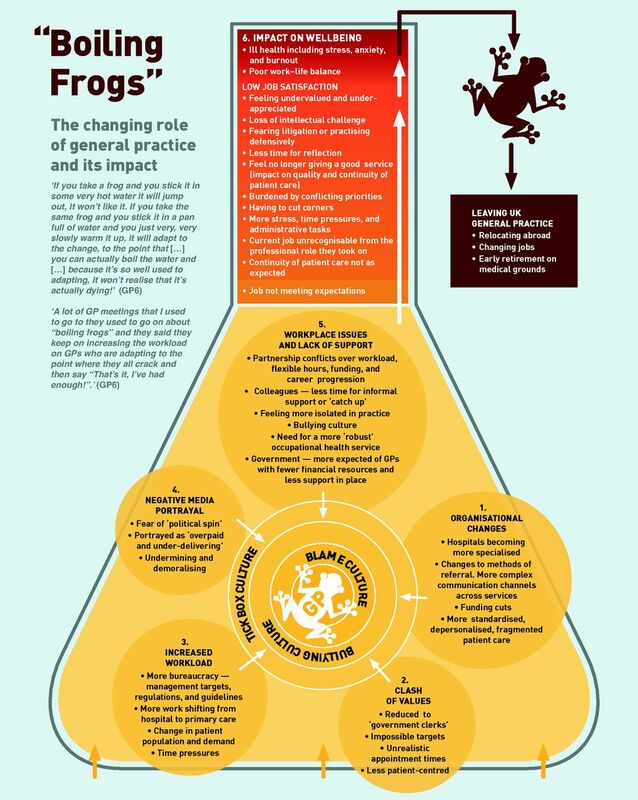 Boiling frogs: the changing role of general practice and its impact. © Natasha Doran 2016. Of the 143 survey responders, 72 (50.3%) were female and 70 (49.0%) male (one unknown). Their median age range was 40–44 years. Forty-six (32.2%) stated that they still work as GPs but outside the EU, seven (4.9%) work as GPs in another part of the EU, and two (1.4%) in another part of the UK (not England). Nineteen (13.3%) do other clinical work, and 22 (15.4%) do non-clinical medical work. Thirteen (9.1%) said that they were full-time parents, and 14 (9.8%) were carers. A further nine (6.3%) had retired voluntarily, and six (4.2%) had retired on medical grounds. The remainder were in non-medical careers. Of the 21 interviewees, 14 participants were female and seven were male, with an age range of 32–54 years at the time of interview. They had been practising GPs in England for between 2.5 and 20 years; their ages when they left general practice in England ranged from 29–50 years. Interviewees represented a maximum variation sample in terms of age, number of years as practising GPs, and geographical location. At interview, five participants were working as GPs abroad; five had either retired early on medical grounds or taken jobs that accommodated their illness; eight worked in related fields, such as medical education, the tribunal service, managerial roles, and public health; two decided to focus on raising their families; one worked in a non-medical career. Although the strength of other social factors such as family issues or attractions to alternative careers were explored during interview and through the online survey as possible determining factors in their decision to leave, participants’ responses were more focused on the impact of their profession on their personal lives, rather than the other way around. The complex interplay of factors explaining why GPs leave practice early was characterised by the overarching theme ‘The changing role of general practice and its impact’. This is discussed in relation to the sub-themes: organisational changes; clash of values; increased workload; negative media portrayal; workplace issues; and lack of support. For most participants, the introduction of the Quality and Outcomes Framework (QOF) marked a defining point where ‘modern medicine’ became a ‘more target driven culture’ (GP12), or a ‘tick box exercise’ (GP1). Factors relating to patients and the media were cited by 63.4% of survey responders. Concerns about media attacks on the medical profession were indicated more frequently (57.0%) than fear of litigation (25.4%) or complaints (17.6%). In light of this reported culture of bullying, several interviewees expressed the need for more support, particularly in the form of a more ‘robust’ occupational health service for doctors. Among survey responders, unhappiness with their professional culture was important for 61%, while 44% highlighted the feeling of a loss of autonomy and professional control. Participants described a series of conditions which they felt contributed to an increasingly pressurised working environment. These included organisational changes resulting in a clash of values and diminishing professional autonomy as health care became more centralised, standardised, and depersonalised; an unprecedented increase in administrative workload; and a lack of support not only from government, but also across services and the wider community due to an ongoing negative media campaign. Personal factors were cited by 90.8% of survey responders, in particular, feeling overworked (53.5%), a wish to improve their work–life balance (49.3%), the work being too stressful (43.0%), and lack of enjoyment of the work (41.5%). Overall, participants felt that their job was not meeting expectations, particularly among GPs who had been in practice for ≥10 years, it was felt that their current job was unrecognisable from the professional role they had initially taken on. Participants had been attracted to GP work in the expectation that it would offer continuity of patient care, professional autonomy, and flexibility in working hours, along with the intellectual challenges inherent in problem solving. However, participants described factors that were both cumulative and multifactorial, leading to their decision to leave practice early in their careers (Figure 1). The extent and rapidity of organisational changes to the NHS, which had led to an increase in day-to-day administrative tasks and overall workload, were perceived by participants to have fundamentally changed the doctor–patient relationship: the very hallmark of general practice. Lack of time with patients meant the ability to practise patient-centred continuity of care was perceived to be compromised and, with it, the GPs’ professional autonomy and values, resulting in diminished job satisfaction. Once their job satisfaction had become negatively impacted, the combined pressures of increased patient demand and the negative media portrayal left many feeling unsupported and vulnerable to burnout and ill health, and, ultimately, to the decision to leave general practice. GP training, recruitment, and retention in the UK is fast approaching crisis point as more GPs leave the profession at a younger age. This study triangulates interview findings with survey results to provide an in-depth exploration of the reasons why this is happening. Participants were self-selecting and therefore may have had particularly strong views. However, interviewees represented a maximum variation sample in terms of age, number of years as practising GPs, and geographical location. In a recent BMA survey, 80% of 1000 responders rated work pressure as ‘high or very high’, with their main workplace stresses being ‘meeting patients’ demands, lack of time, and excessive bureaucracy’.36 In a study looking at motives for early retirement among GPs in the Netherlands, policies related to workload reduction were considered the most useful instruments to control retention and retirement.37 The current mixed methods study complements and extends this literature, by showing the cumulative, inter-related, and multifactorial reasons as to why GPs are leaving practice early in their careers. The early loss of GPs causes a considerable drain on NHS resources. To improve retention of GPs in practice, NHS leaders need both to minimise the pace of administrative change and to reduce the amount of time spent by GPs on work that is not face-to-face patient care. For those leaving practice early, exit interviews would help identify specific local as well as more general reasons for their leaving the GP workforce. Many GPs reported that they had enjoyed direct patient care. Research is needed on how the skills and experience of GPs can most usefully be harnessed, rather than being lost to the NHS. The authors would like to thank all volunteer participants who kindly gave their time to share their experiences of working in UK general practice. We also wish to thank Justin Devine for his graphic design work. The study was jointly funded by Health Education England and NHS England. Ethical approval was granted by the Research Ethics Approval Committee for Health (REACH) at the University of Bath (REACH reference number: EP 13/1451). Revision requested August 20, 2015. (1997) The new NHS: modern, dependable Cm3807 (The Stationery Office, London). (2012) General and Personal Medical Services England 2001–2011 (Health and Social Care Information Centre, Leeds). Improving general practice — a call to action. Evidence pack. 2014, http://www.england.nhs.uk/wp-content/uploads/2013/09/igp-cta-evid.pdf (accessed 16 Dec 2015). NHS Health Education England. General practice (GP). http://www.nhscareers.nhs.uk/explore-by-career/doctors/careers-in-medicine/general-practice/ (accessed 16 Dec 2015). (2014) Securing the future GP workforce: delivering the mandate on GP expansion. GP Taskforce final report (Health Education England, Leeds). (2014) Unit costs of health and social care 2014 (Personal Social Services Research Unit, Canterbury). General and Personal Medical Services, England — 2004–2014, as at 30 September. http://www.hscic.gov.uk/catalogue/PUB16934 (accessed 16 Dec 2015). Survey reveals extent of GP workforce crisis. http://bma.org.uk/news-views-analysis/news/2014/may/survey-reveals-extent-of-gp-workforce-crisis (accessed 16 Dec 2015). (2014) Early GP leavers interim report: report to HEE & NHS England dated 4th May 2014 (University of Bath, Bath) http://opus.bath.ac.uk/47271/ (accessed 16 Dec 2015). (2014) A qualitative study exploring the reasons why GP’s leave practice early in their careers and the barriers to their return (University of Bath, Bath) http://opus.bath.ac.uk/47274/ (accessed 16 Dec 2015). (Feb 27, 2013) NHS facing GP workforce crisis. Telegraph, http://www.telegraph.co.uk/news/health/news/9897615/NHS-facing-GP-workforce-crisis.html (accessed 16 Dec 2015). General practice faces ‘serious threat’ to recruitment. http://bma.org.uk/news-views-analysis/news/2014/june/general-practice-faces-serious-threat-to-recruitment (accessed 16 Dec 2015). (1999) Recruitment and retention of general practitioners in the UK: what are the problems and solutions? Br J Gen Pract 49(447):829–833. (2002) Recruitment of UK-trained doctors into general practice: findings from national cohort studies. Br J Gen Pract 52(478):364–367, 369–372. (2002) GP recruitment and retention: a qualitative analysis of doctors’ comments about training for and working in general practice. Occas Pap R Coll Gen Pract (83):iii–vi, 1–33. (2012) Where have all the GPs gone — where will they go? Study of Finnish GPs. BMC Fam Pract 13:121. (2013) Can organizational justice help the retention of general practitioners? Health Policy 110(1):22–28. (2012) Motives for early retirement of self-employed GPs in the Netherlands: a comparison of two time periods. BMC Health Serv Res 12:467. (2001) Quarter of GPs want to quit, BMA survey shows. BMJ 323(7318):887. (2000) GP job satisfaction in 1987, 1990 and 1998: lessons for the future? Fam Pract 17(5):364–371. (2006) Job satisfaction among general practitioners: a systematic literature review. Eur J Gen Pract 12(4):174–180. (2011) Motivation and satisfaction in GP training: a UK cross-sectional survey. Br J Gen Pract doi:10.3399/bjgp11X601352. (2006) GP job satisfaction in view of contract reform: a national survey. Br J Gen Pract 56(523):87–92. (2003) National survey of job satisfaction and retirement intentions among general practitioners in England. BMJ 326(7379):22. (2002) The causal links between stress and burnout in a longitudinal study of UK doctors. Lancet 359(9323):2089–2090. (2013) Open access to general practice was associated with burnout among general practitioners. Int J Family Med 2013:383602. (1998) Individual and organizational predictors of depression in general practitioners. Br J Gen Pract 48(435):1647–1651. (2009) The mental health of health care professionals: a review for the Department of Health (National Clinical Assessment Service, London). (2008) Balint groups as a means to increase job satisfaction and prevent burnout among general practitioners. Ann Fam Med 6(2):138–145. (2010) The Schwartz Center Rounds: evaluation of an interdisciplinary approach to enhancing patient-centered communication, teamwork, and provider support. Acad Med 85(6):1073–1081. (2009) Association of an educational program in mindful communication with burnout, empathy, and attitudes among primary care physicians. JAMA 302(12):1284–1293. (2012) The impact of a program in mindful communication on primary care physicians. Acad Med 87(6):815–819. (2013) Transitions in medicine: trainee doctor stress and support mechanisms. Journal of Workplace Learning 25(6):368–382. (2013) BMA must ‘act now’ on stress and burnout, say doctors. BMJ Careers, http://careers.bmj.com/careers/advice/view-article.html?id=20013164 (accessed 16 Dec 2015).